Why Are Residential and Commercial Consumers Buying Nayadic Wastewater Treatment Systems? NAYADIC is an efficient Wastewater Treatment Plant that has served the needs of residential and commercial customers all around the world. 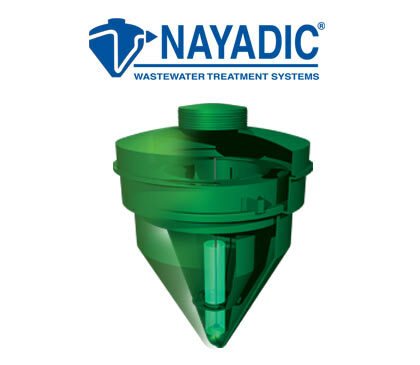 Specifically engineered to provide the highest degree of treatment with only minimum maintenance requirements, NAYADIC is your first choice to handle your wastewater treatment needs. With over 30 years experience, NAYADIC is one of the oldest names in the wastewater industry. As such, NAYADIC continues to provide our customers with quality products backed by quality people. Because the Nayadic utilizes an “aerobic” treatment process, there are no offensive “rotten egg” odors commonly associated with septic tanks. By simply removing the access cover of the Nayadic plant you can perform all necessary inspections and maintenance. Although periodic maintenance is necessary to insure continuous, trouble-free operation, all service is provided by local factory-trained representatives. The Nayadic alarm system alerts the homeowner of any pending problems. Other than routine inspection and periodic pumping of the excess solids, the Nayadic requires very little maintenance. In many instances, an authorized Nayadic service representative can perform repair of the compressor in the field. The lightweight, fiberglass construction eliminates the need for expensive equipment to transport and install the Nayadic. The system’s conical shape requires less excavation than traditional systems, which reduces time onsite when digging in rocky soils or areas with high ground water. The compact design is perfect for tight lots. Consolidated Treatment Systems Inc. warrants each Nayadic treatment plant to be free of defects in workmanship for a period of two years from the date of installation. Each Nayadic system comes complete with tank, audible/visual alarm, compressor and hardware. The system’s design is based on the same time tested engineering principles found in today’s municipal systems. The Nayadic has been certified under ANSI/NSF standard 40 protocol as a class 1 system and removes 95% of wastewater contaminants. To insure proper sizing of each plant there are five individual treatment plant capacities: 500, 600, 800, 1000, 1500 GPD (gallons per day). For larger flows the systems can be clustered together to achieve the desired flow.